It had been a while since I’d visited the Chiefland Astronomy Village; I hadn’t been there since February 2015, actually. There were a number of reasons for that. Most prominently, the weather. As I said last week, this has not been much of a year for amateur astronomy east of the Mississippi. One of the cloudiest springs, followed by one of the cloudiest summers, followed by one of the cloudiest autumns in memory. Why drive 350-miles to sit in a motel and watch it rain when I can sit home and watch it rain in comfort? There were other factors involved, too. Like maybe a hangover from the many, many nights I spent on the CAV field working the Herschel Project. I’d done the Chiefland journey so many times, especially from 2010 – 2012, that I just needed a break. All those reasons and a few others as well conspired to cause my longest absence from Chiefland since I began observing there in 2002. I didn’t believe my desertion of the Billy Dodd Observing Field would be forever, though; I just needed the right time and circumstance for my return. And perhaps that time and circumstance had finally come into conjunction. 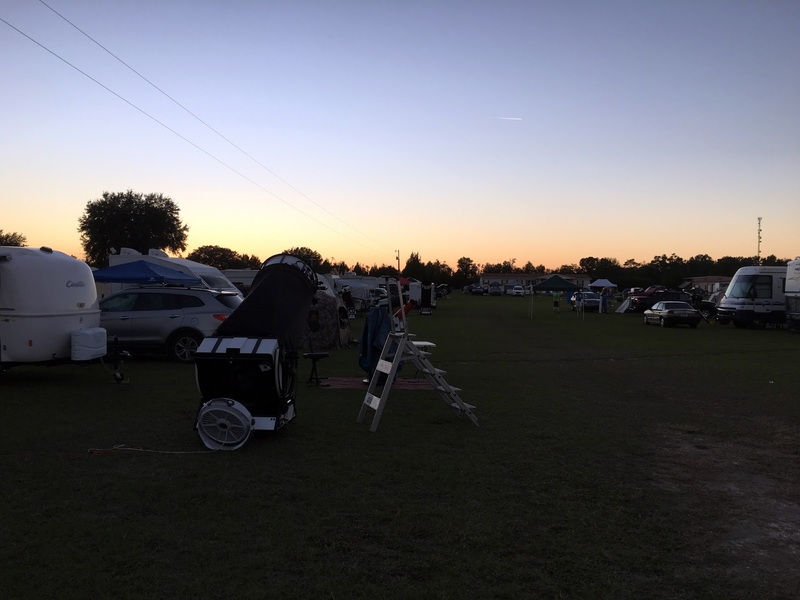 I’d been aware for months that the group that observes on the “old” (formerly owned by Tom Clark) field, the “Chiefland Observers,” was planning to resurrect the Chiefland Star Party. Indeed, I got a call from my friend Carl Wright telling me that was exactly what he wanted to do, and in a big way. Even as fall came in, I still wasn’t quite sure I was ready for another journey “down Chiefland way,” but an honest to God star party like in the old days sounded fun, and I wanted to support the Chiefland Observers. I told Carl I’d attend and, in addition, agreed to give a presentation at the event, gratis. 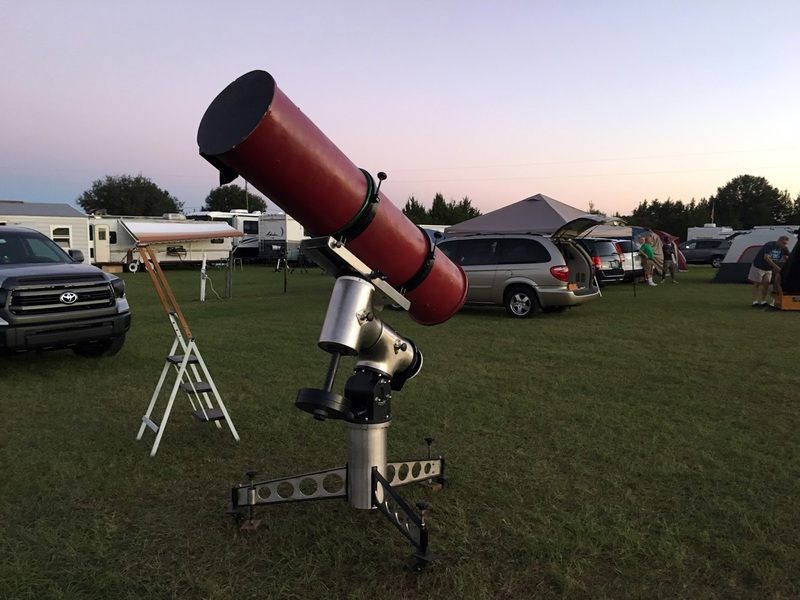 Does the course of amateur astronomy always run smooth? Not hardly. First problem came when I tried to make motel reservations. 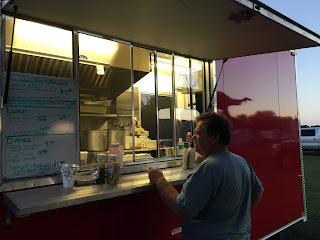 One of the best things about CAV for me is the relative proximity of motels, which I much prefer to tents, but when (after waiting until the last minute) I tried to make reservations for Thursday – Sunday, I was stymied. All I could get was one night, Thursday, at the Chiefland Quality Inn. There was nothing else available in town. Not even Miss Dorothy, a master at finding and booking accommodations, could get me anything. Not e’en at the somewhat seedy Days Inn. This was surprising but not unprecedented. Despite its status as a small town off the beaten path, Chiefland has its share of tourist attractions and festivals. I’d been caught out because of that once before, one summer during the Herschel Project, but that was summer. I didn’t expect problems in autumn. Oh, well. Since I’d agreed to give a talk, I thought I should bite the bullet and attend the star party anyway. I booked a room at the Quality Inn for Thursday; I’d check out Friday morning and tent camp for another day or two. The second fly in my ointment came in the form of a phone call from star party organizer Carl Wright. Seemed as there had been some sort of mix-up. They had me down as speaking on Thursday instead of Friday as I thought we’d agreed on. Alas, for several reasons I wouldn’t be able to make it down until after they had me scheduled to speak. Was I annoyed? Yes I was. I'd spent considerable time tailoring a presentation for the event, and felt disrespected. I thought I deserved better than the "Oh, well, sorry about that," which was basically what I'd received. Since I'd agreed to cover my fuel and motel expenses on my own, I thought seriously about skipping the event. Frankly, for some of the unrelated reasons hinted at above, I wasn't much in a star party mood anyway. On the other hand, I couldn’t see myself missing out on the revived CSP. 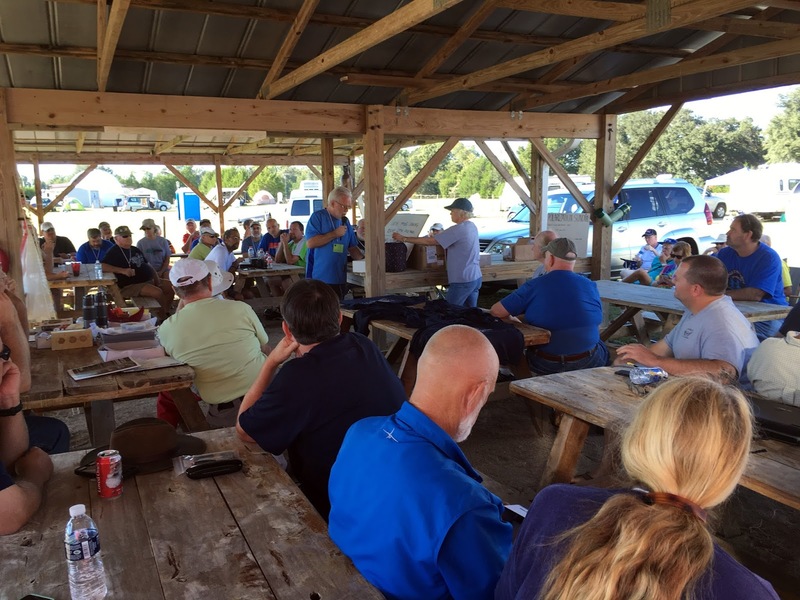 I’d had great times at the old star parties and the old spring picnics, and from what Carl said, with well over one-hundred registrations this would be a lot like the old days. I also thought that getting out and about would be better than moping around the house. So, come Wednesday afternoon, I loaded up Miss Van Pelt, my Toyota 4Runner—or more properly rearranged and switched out a few items. I’d had the good sense to leave most of the astro-gear in the truck following our return from the Deep South Regional Star Gaze the previous Saturday. All I had to do was remove the old C8 and CG5 (which I'd hoped to sell at the star party but hadn't) and replace them with the Edge 800 OTA, Mrs. Emma Peel, who would ride on the VX mount. The 80mm Megrez II refractor was still in her case and ready to go and so was the VX. Naturally, given the motel situation, I packed my camping gear--tent, cot, sleeping bag. Early Thursday morning, I was ready to roll, but delayed my departure until 8:30 am. I was trying to wait for the garbage pickup; we’d missed it being at the DSRSG the previous week, and the can was beginning to overflow. While, I'd lose an hour on the journey to CAV, which is on Eastern time, if I left at 8:30 and didn’t waste time, I’d be in Chiefland by three-thirty or so, which would allow me a couple of hours for set up before sundown. Since I did have a motel room for Thursday night, I wouldn’t have to worry about messing with the tent until Friday, which would expedite the process. Finally on the road, I passed the time listening to Sirius XM Radio and getting my observing plans settled in my mind. My agenda would be much like at the DSRSG, prime focus imaging with my DSLR in the service of a magazine article I was writing, along with some video astronomy time (on the last night, I thought) with the Revolution Imager. The 350-miles between Mobile and Chiefland didn’t exactly pass in a flash, but it didn’t seem too terribly long before I was leaving the Interstate and getting on the storied Florida – Georgia Parkway after refueling at the old Sunoco station at Exit 225 (I even allowed myself a little junk food in the form of a SASQUATCH BIG STICK). When I arrived in C-land a little over two hours later, I stuck to my time-tested Plan: check into the motel, out to the field for gear set-up, back to town for needed supplies from Wally World, return to the CAV to await darkness. This time of year you have to hustle, but the routine is such a familiar one that I usually don’t have any trouble beating twilight. The big surprise? I hadn’t been overly depressed about the motel situation given the “quality” of the Quality Inn last time I’d stayed there (the Days Inn has been even worse the last couple of years). Now, I was somewhat depressed. The new owners of the Quality Inn have made great strides. It still ain’t exactly the Ritz, but it is now at least as good as the Days Inn was years ago when it was a Holiday Inn Express: comfortable and clean. I enquired about rooms at the desk, but there was still nothing; apparently there was some sort of huge motorcycle rally/meet in progress and every room in town really was booked. The second surprise was the observing field. I wasn’t quite sure what I’d find, and was gobsmacked, frankly, by what I saw. 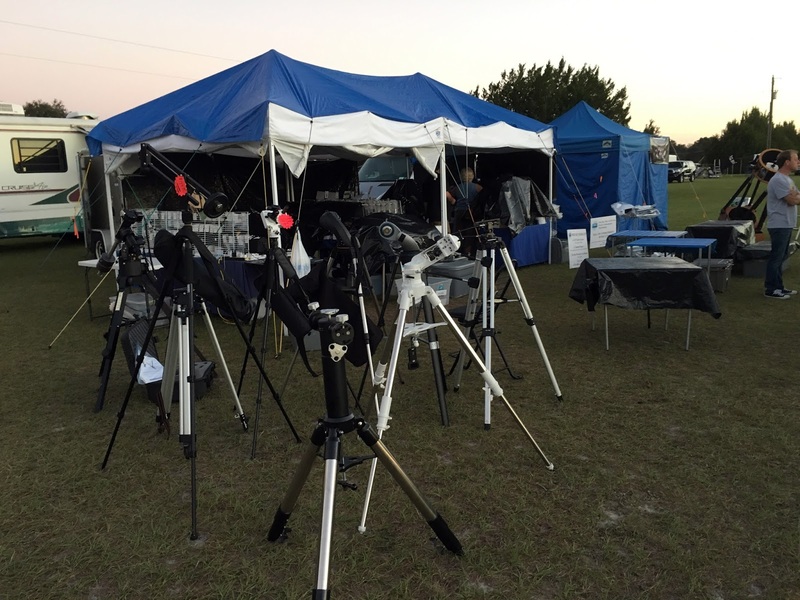 Maybe there weren’t quite as many scopes on the field as there’d been at the height of the old star party, but almost. And once I’d got the EZ-Up and scope squared away, a walk around the field revealed there were some things the new event had that the old star party lacked. First off all, food service. There was a food truck—well, trailer—selling inexpensive meals (think “Micki’s Kitchen”). But the biggest deal was for me was all the vendors. Dealers at star parties have become something of an endangered species the last few years because of the economy, I suppose. But given what I saw at CSP, the welcome presence of gear merchants at star parties is making a comeback. There was Camera Concepts with a huge, and I do mean huge, layout. There was Explore Scientific with mucho stuff. My old friend Chuck Pisa was there too with a big display of his own—Chuck is now the distributor for Olivon. 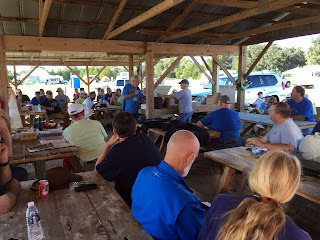 Howie Glatter was showing off his famous (and famously good) collimation tools and more. Daystar was onsite, too. There was so much cool-looking stuff I knew I would most assuredly wind up buying something if I didn’t win anything at the raffle. All that astro-stuff was just too darned tempting. Since it is unlikely to say the least that I will win anything at a star party, I figured I’d surely be buying. What the Chiefland Observers had done for their first event was admittedly impressive, as I told Carl. Telescopes everywhere, including on the “new” field to the west. The star party is now a cooperative affair between the two groups, something I am pleased to see. After my quick survey of the vendors, I returned to town for my customary visit to Wally World. Grabbed ice, granola bars, and a couple of other necessities, and with the Sun now well and truly sinking it was time to scurry back to the observing field. There, it was obvious it was going to be a beautifully clear if dew-heavy night. I am constantly amazed that the skies of the CAV remain so good. When conditions are right they can still just blow me away. The rest of the story Thursday went about like it usually does on the first night of any star party for me. I was tired, and that led to me struggling with the telescope. I just couldn’t get the VX and Edge 800 decently aligned. Everything was off. Till I realized the mount/scope was woefully out of balance thanks to my fuzzy-headedness. When I finally figured out what my problem was, I got an exposure sequence of M37 underway. When I’d got the scope guiding with PHD2 and the subframes clicking off with Nebulosity, there wasn’t much else for me to do. Nothing, actually, which was a good thing this time. It gave me the opportunity to try out the new products Russ Lederman (Denkmeier Optical) was showing off. One of those products was Russ’ new 3-D eyepieces. When he first told me about these oculars a few weeks before, I was skeptical. Russ said the 3-D effect was “startling,” but I had my doubts. Actually looking through a pair of the L-O-A (“Lederman Optical Array”) 21mm eyepieces changed my mind. There was M27, the Dumbbell Nebula, floating before me. It was in the foreground, and the field stars were in the background. I don’t mean the subtle 3-D effect you get with any binoviewer and normal eyepieces, I mean a dramatic effect. The eyepieces worked on any object we turned the telescope, Carl’s 22-inch Dob, to. Bright. Dim. Didn’t matter. The 3-D was obvious and impressive. Frankly, I think the results would have been even better with a little less focal length, but it was nevertheless immersive—if a little artificial feeling. Naturally you aren't seeing real 3-D, it's an artificial special effect, but it is pretty. That wasn’t all. Russ was also demonstrating a pair of 8x42mm binoculars that incorporated the same technology. In their own way, the binocs were as impressive as the eyepieces. The North America Nebula, which was easy with the glasses on this night, showed the faux 3-D effect strongly. 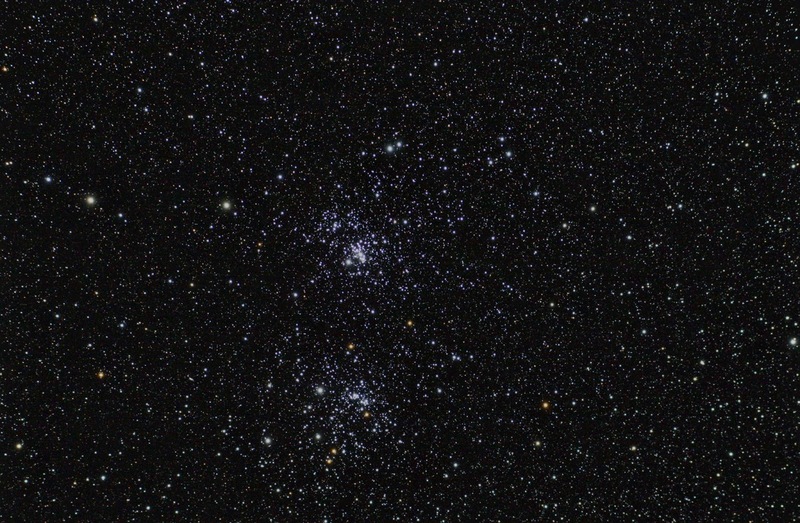 Double Cluster? Maybe even better. Would either the eyepiece or the binoculars be something I'd consider buying? They work exactly as advertised, but I'm not sure how long it would be before the novelty wears off. Shortly after I finished admiring the Universe in 3-D, my exposure sequence ended. I then went on to target two, M79, which I believed would be it for the night. It had taken me so long to diagnose and fix my telescope problems that I was late in getting started and it was now almost midnight. I did an hour on Lepus’ little globular (plus an hour of darks) and threw the Big Switch and not at all reluctantly. I was tired to the point where not even a Monster Energy Drink could revive me. It was oh-so-nice to sip a little warming Burgundy and watch television back at the warm, dry motel—as I’d predicted, the night had been almost as damp as my evenings at the Deep South Regional Star Gaze had been. I’d had a nice evening despite my problems, and I had to admit some of that old Chiefland magic seemed to be back. But I wondered about Friday night. I’d be transferring my residence to a tent, after all. Well, I’d examine my options on the morrow. For tonight I was done. After a free motel breakfast—scrambled eggs and fruit—it was time to check out of the Quality Inn and head for the observing field. Well, not quite. First stop was Wally-World again. I had become unsure about the wisdom of setting up my tent. Carl had one pitched, and in the damp conditions it had begun to get moldy in just a few days. I conceived the idea of sleeping in the back of the 4Runner instead. I was afraid a sleeping bag on cargo bed might be a bit hard on my back, though, so I went looking for something to provide at least a little padding. Cruising the Wal-Mart outdoor department aisles, I was torn between an air mattress and a simple sleeping bag pad. The air mattress would be easier on my back, but I’d have to inflate it and wrestle with it. I decided that for one night one of the thin foam pads would be sufficient. One night? I wasn’t going to stay through Saturday? I didn’t think so. If I’d had a motel room, it would have been different, but I didn’t. I suspected two nights in Miss Van Pelt would be OK, but that wasn’t the problem. The problem was facilities. It was in the low fifties/upper forties Friday morning, and I suspected it would be the same Saturday and Sunday. That does not lend the site’s open air showers much appeal. And the portapotties were getting a little, well…you know… If tenderfoot me can’t perform my morning ablutions in comfort first thing in the morning, I am not much good for the rest of the day. I had begun to think I might hit the road Saturday shortly after first light. I was sorry I wouldn’t have time to work further with the Revolution video camera—I needed to do more DSLRing Friday night—but I wasn’t sure conditions would be very good Saturday anyway. The sky had been great Thursday, and was predicted to be the same Friday, but Saturday night would tend to partly cloudy. If I had to turn astro-wimp, Saturday was the night to wimp out on. Back at the CAV, I did some reconfiguring. I removed the tent and cot from the 4Runner, but not to set them up, just to clear a sleeping space in Miss Van Pelt’s commodious rear. With pad and sleeping bag arranged, I got in to give it a try. I am just short enough to be able to stretch out completely and rest in comfort in the back of the 4Runner. The truck is quite well insulated and has AC and DC outlets in back for phone charging or running my radio or DVD player. I thought I might actually be more comfortable in the truck on a cool night than in my (good) tent. After getting my bedroom area in order, I also reconfigured the scope, switching out the Edge SCT for the fluorite refractor. My goal was semi-wide-field, and especially the vaunted double cluster, and the Megrez II ought to be perfect for that. This time, I made sure balance was just right: slightly east heavy, but not too east heavy. What did I do with all the hours left till sundown? Relaxed. Read (Batman: Earth One). Took pictures for yet another magazine article I am doing. Admired my fellow attendees’ scopes. Cruised dealer tables trying to decide what I wanted. The day was long, very long. One of the reasons I find a motel attractive is that I can surf the Internet and watch TV there, which makes the daylight hours pass much more quickly. Nevertheless, I survived, making it to raffle time at 2 pm. How were the prizes? 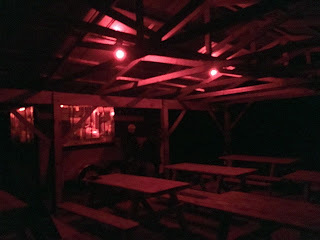 As with everything else, they were what you’d expect at a star party that’s been going on for years, not at a new one. Why the table practically groaned under the weight of prizes donated by Camera Concepts, Explore Scientific, Olivon, Howie Glatter, Orion and more. Which wouldn’t help me, I guessed. Doesn’t make a difference how many prizes there are, I never win anything anyway. Darkness came, and I got to work, doing a two hour sequence (with darks) of the Double Cluster. Looking at the raw shots coming in, I could tell it would be a good one—given my modest imaging skills. When Nebulosity played the little fanfare that means “sequence is done,” I went on to target two, which finished up at about midnight. What then? I hibernated the telescope and went to bed. I went to bed at freaking midnight? Yep. But I had a plan. I’d grab a few hours of shuteye and get up at around 3 am. That would help me be rested enough for the journey home in the morning—I’d indeed had enough of portapotties—but also allow me to get in some visual observing of the winter sky including with my brand new eyepiece. Snug in my sleeping bag in the 4Runner, looking up through her Moon roof at the wheeling stars above, I found it easy to drop off, and it seemed as if only a few minutes had passed before I was being awakened by my iPhone’s alarm (my new 6s…in the course of packing for Peach State, I dropped my old 4s and broke it). Outside, the winter star pictures were riding high, and it wasn’t long before I had the Megrez refractor, Miss Veronica Lodge, pointed at M42. The sky was dark and clear, and the William Optics refractor, while small in aperture, is very finely made. In it, M42 and the Running Man Nebula were a beautiful dream whether in the 15mm Orion Expanse (I’d brought along a box of 1.25-inch eyepieces just in case) or zoomed in with my wonderful new 4.7 ES. The new eyepiece displayed plenty of contrast and was tack sharp across its entire huge field. I really could not have wished for better. I’d been told the Explore Scientific 82-degree field eyepieces are some of the best values in amateur astronomy, and now I believed it. Every object that appeared in my telescope was sparkling with beauty, and again and again I couldn’t believe this was “just” an 80mm telescope. What were the standouts? The Tau Ceti cluster was wonderful in the 4.7, and, when I equipped it with a UHC filter, so was the nearby Thor’s Helmet Nebula. In the 15mm and 20mm Expanses, the bigger objects strutted their stuff. 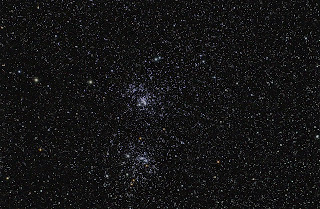 M35 was a wonder (its little companion cluster, NGC 2158, began to resolve with the 4.7). The piece de resistance, though? M45, the good old Pleiades. In the 20mm Expanse, what I saw was much like the image I shot of the Seven Sisters at DSRSG: burning sapphires wreathed in nebulosity. This was one time I didn’t have to guess as to whether I was seeing the Merope Nebula. It was just there, and so were some of the even less prominent nebulous patches. So it went for a little over an hour, until I reluctantly tore myself from the scope and returned to bed for a while. At six, I was up again to pack. It was damp. It was cold. And the experience of early morning gear tear-down was even less pleasant than it had been at DSRSG the previous Friday, but I pressed on, finishing by 8 am, and was shortly thereafter on the road for home. I think you should consider a small camper. we picked up this used camper just before the Star Party to replace an older one. Yes that is a Harbor Freight 45 watt solar panel setup and you would be suprised how far 45 watts can go when you are camping. Yeah, I am probably going to be getting to old for popups one of these days, but so far I am doing ok. I pulled it with my Ford Escape. It kind of hurt gas mileage, but on the plus side there were no hotel bills. Well the Escape has that turbo charged engine. It will get 30 on the highway unloaded, but put a trailer on and the turbo charger kicks in. Pulling the camper I only got about 16, but overall for the year I am a head.